Indoor plants have never gone out of fashion. In recent times succulents have become all the rage. Their unusual forms and myriad colors make them an interesting home accessory. 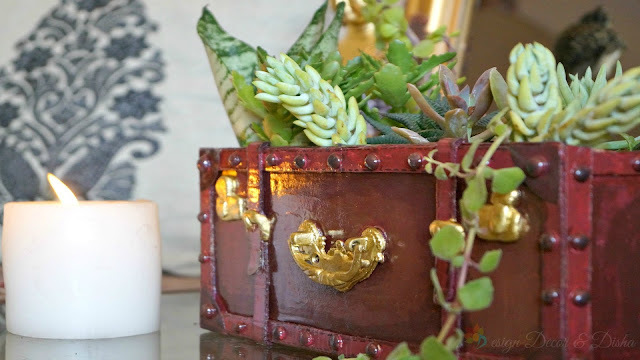 Today I'll be sharing all about growing indoor succulent container garden. 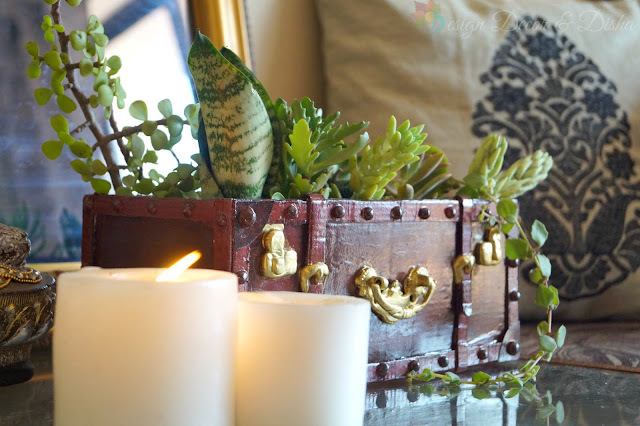 Here I have a complete video on how to grow and care for succulents indoors. First, start with selecting a right pot to grow a succulent container garden. Make sure that the pot/planter should have drainage hole as succulents don't love wet soil. Having said that it is not that you can't grow succulents in a pot that doesn't have a hole. In that case, succulents will survive but they will not thrive until you know when and how to water them. I too have quite a few pots without a hole and my succulents are doing well but it is always great to have holes at the bottom of the container. 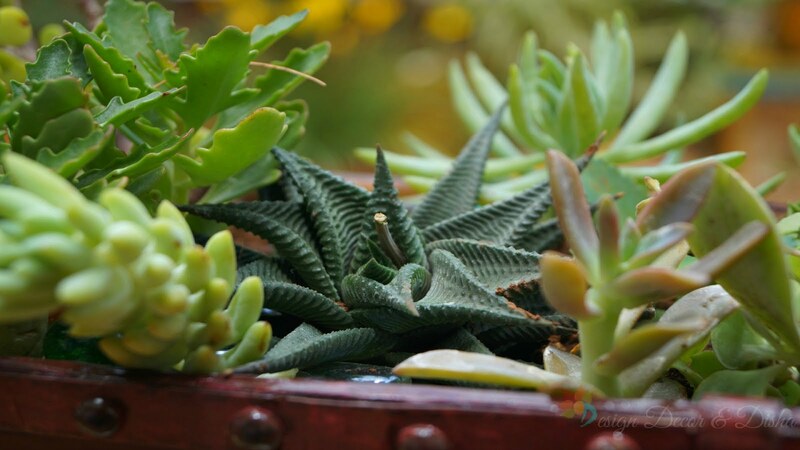 The right succulent potting mix is also the key to growing healthy succulents. Well-draining soil that retains very less moisture is good for succulents. Mixing sand/gravel/perlite/pumice/tree bark/coconut fibre in the soil makes it less compact and well-draining soil. Mixing these ingredients in the soil also ensures good air flow and the soil dries out quickly. That's what succulents love. Also, don't forget to feed your succulents. Like all the other plants, succulents need food too to grow healthy and produce more colors. Mix compost in the soil and do fertilize your succulents in their growing season or every few months. First, put the gravel or small rocks at the bottom of the container and then fill the container with the succulent potting mix. While potting the succulents it's not necessary to leave gaps between plants. As succulents grow slowly and can be potted closely in a container. A small room is just enough for succulents to grow. Take out the succulent from the nursery pot, loosen the soil and now pot the taller or most colourful succulent in the centre if the pot is round and in one of the corners if the pot is rectangular. Now pot trailing succulents near the edges of the container and then fill in all the gaps with the rest of the succulents. You can use flowering succulents to add more colors and a bit of drama. Watering succulents is the most crucial and important job. Avoid using a watering can with the shower head as it will make the foliage wet which is not good for succulents. Any pot that has a spout and can direct the water stream into the soil works best for watering succulents. There is no such rule that you should water succulents once or twice a week. Water the succulents only when the soil has dried out and water them until the extra water starts to come out of the drainage hole now wait for few days and check when the soil has dried out water the succulents again. If the pot doesn't have drainage holes make sure that you are watering just the enough amount not too less and not too much. If you water them too much then excess water can accumulate at the bottom and the roots will start to rot and eventually the succulents will die. If you water them less then the leaves will start to wrinkle and become dry. Succulents love high temperature and lot of sunlight but everything in excess is always harmful. We are talking about growing succulents indoors so ideal location for them would be the one where the succulents get at least 4-6 hrs of light (not direct sunlight). Choose the succulent varieties that love bright shade like all the succulents that are green and pale can do well indoors on the other hand colourful varieties and the pokey ones with lots of spines(cacti) do well in sunlight. 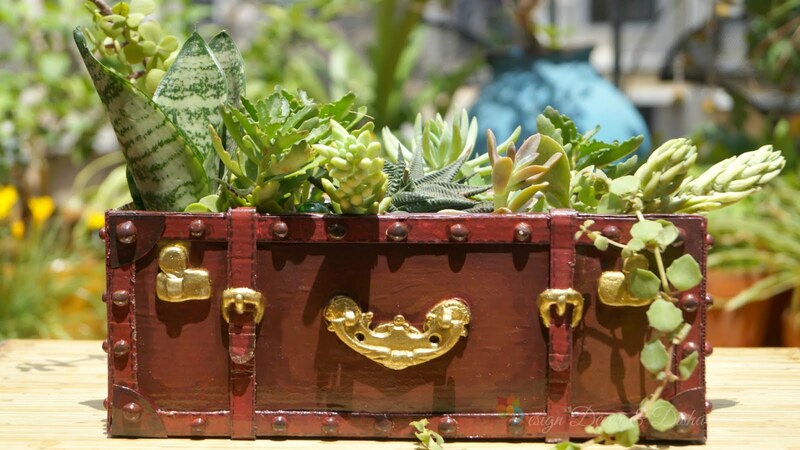 Succulents can bear 2-4 hrs of sunlight more than that can cause sunburn. I think I have covered almost all the important points here to grow succulent container garden indoors especially in Indian climate. For a detailed post, you have to wait for a while as I am working on it. I hope now you have all the answers and are ready to grow your own succulent container garden. If you have any queries please leave me a comment and I'll be glad to answer. Do check out the video on YouTube and find all the useful links in the description box there. 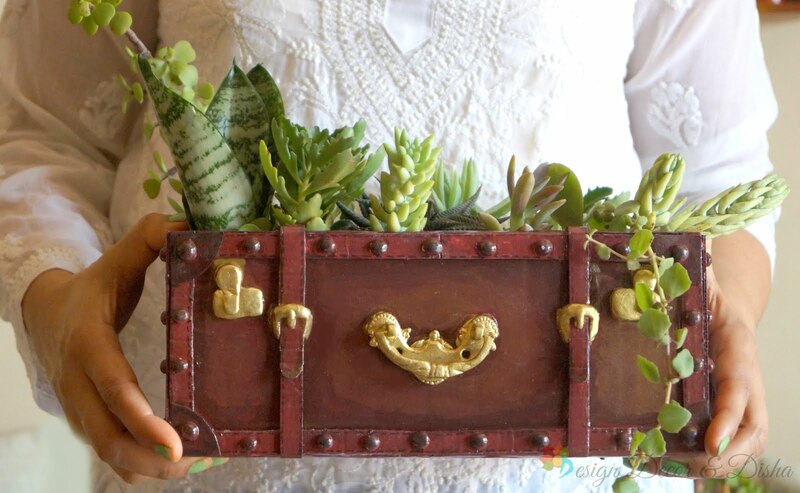 If you liked my vintage suitcase planter then you can buy the exact same piece online click here to buy.